In this day and age, you might think there’s nothing new under the sun, no way to reinvent the wheel. Inventors beg to differ: Driven by desires to meet a need, find a fix, make a buck, or simply scratch the creative itch, they’re intent on bringing something novel and useful into existence—something that’s never quite existed before. 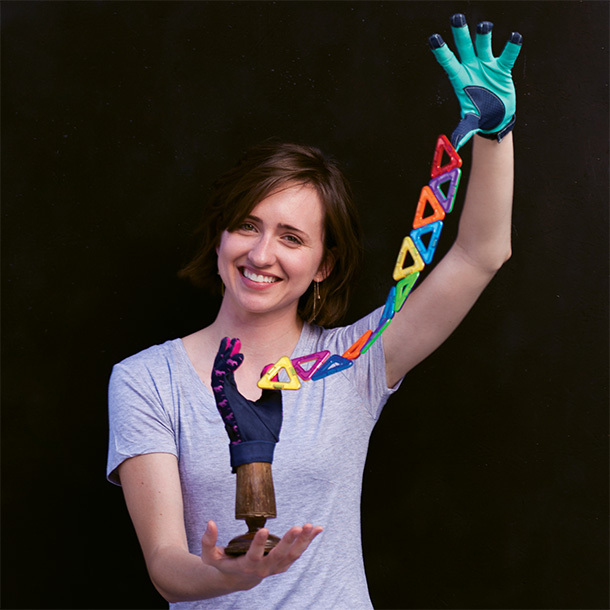 While she was a junior at Appalachian State University, Bailey Williams spent days with her hands and wrists duct taped at the joints. What sounds like a college prank was actually part of an “empathy study” for her industrial design class assignment: Create a product for two- to five-year-old children with limited fine motor skills. The project got off to a slow start, until Williams’ professor provided inspiration with the announcement that one student team would advance to Texas Christian University’s 2014 Values and Ventures Business Plan Competition. That and the firsthand frustration of fumbling with clothes and food (and spilling her entire purse into a restaurant toilet) cemented Williams’ vision. With that revelation, Williams transitioned from her initial symptom-abating ideas (toothbrushes and forks with finger holes, for example) to a series of rehabilitative gloves. One bore suction cups so users could strengthen their muscles in the bathtub. Another, with magnets dropped into each fingertip, she’d use to pick up paper clips—at least when her hands and fingertips weren’t clicking together. “That’s when I realized I wouldn’t need a prop for this tool,” she recalls. And with a small tweak of the glove’s thumb, Williams’ hands were snapping into what’s called the pinch or grip motion—a key step to refining dexterity, she later learned. Not only did Williams’ concept, now called MagnaGrips, win second place and $15,000 in Texas, but Eric Schenkler, managing director at ASU’s Transportation Insight Center for Entrepreneurship, has driven its progress beyond graduation. Under his guidance, the aspiring inventor has written a business plan, obtained a provisional patent (full patent pending), partnered with a manufacturer that’s honing prototypes, and networked with medical professionals, who see further potential for MagnaGrips among stroke and trauma patients. Additionally, ASU’s exercise science students are studying the glove and its functionality, which “will give the business and design more of a backbone,” Williams reasons. She’ll use the data they generate to approach investors. The Original Handle, which Klinger designed and debuted in 2013 through his start-up, GoWorx, attaches to the GoPro camera with a single screw and removes bodily contortions from the process of capturing low-angle action shots. His 2014 follow-up, the brass knuckles-shaped GoKnuckles, also encourages inventive content creation from skaters, snowboarders, surfers, hikers, and bikers. In 2015, GoWorx introduced the FreeRide, a mount for securing cell phone cameras to bikes, cars, tripods, and more. 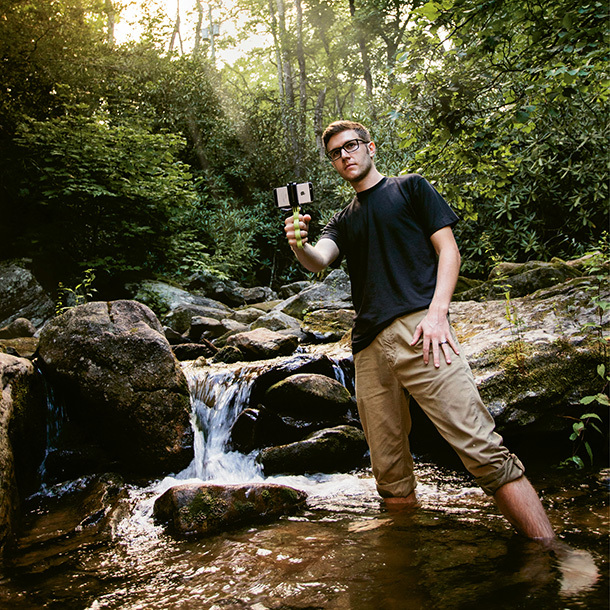 In short order, GoPro spawned what Klinger, an Appalachian State University industrial design graduate now based in Asheville, calls “an entire ecosystem” of support products. 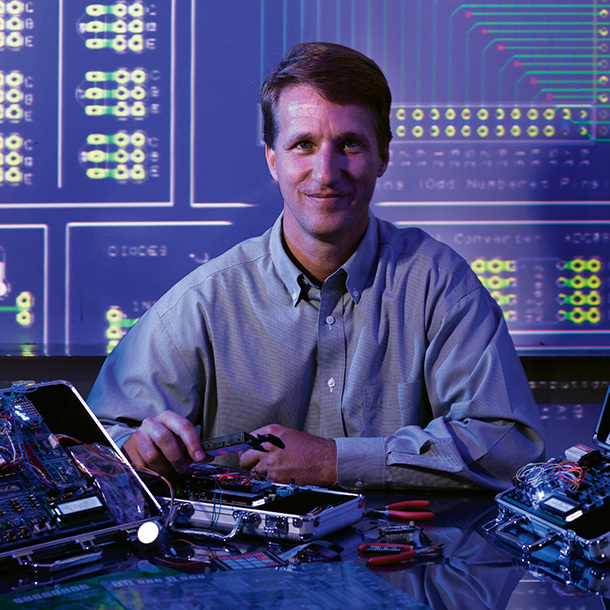 The company’s popularity has swelled with each new device, and customers have become an active force in the business. Hundreds of financial backers brought GoKnuckles and FreeRide to market through Kickstarter campaigns, for instance, and GoWorx’s online presence increasingly champions user-submitted sights and stunts. Cultivating this e-community became a highlight of doing business for Klinger, who periodically sharpened his entrepreneurial and leadership skills though programs such as Mountain BizWorks’ ScaleUp WNC, Venture Asheville’s Elevate, and the Kauffman Foundation’s One Million Cups. “No one’s really curating a collection of products for content creators—all the new devices and cool cameras out there,” he reasons. “So, we’re in that space now.” Klinger’s web store offers non-GoWorx items like camera drones alongside his personal inventions. His tweaked vision is to grow the e-commerce platform into a one-stop shop that features pioneering brands catering to content chasers. 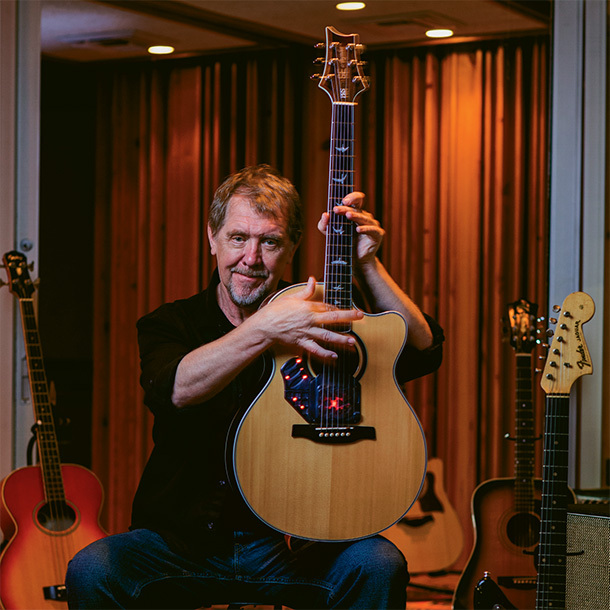 “If you tap on something and you get a tone, there’s music hidden in there—and I have the technology that could bring it out.” So says Paul Vo, an Asheville-based inventor who applies technology to expand the range of traditional acoustic instruments. Vo’s latest creation is the Vo-96, a low-profile device that attaches to the body of an acoustic guitar. Put very simply, the Vo-96 harnesses the power of magnetic fields, channeling them to interact with guitar strings. As Vo explains, “out come sounds that have never been possible” in a stringed instrument. Vo acknowledges that such concepts can be difficult to explain to laypeople. “When you do something that’s not in the mainstream, when you try to do something that hasn’t been done before, you run into the problem of people not even understanding what it is,” he says. He notes that funding can also be an issue, but in Vo’s case, that hasn’t been a problem. Based on his reputation for innovation—he helped design Moog Music’s revolutionary Moog Guitar and Moog Lap Steel, among other audio and musical breakthroughs—a Kickstarter campaign for the Vo-96 yielded more than $120,000, far above its goal of $50,000. To date, Vo has built and shipped nearly 100 units. Soon Vo grew bored with conventional education, and he dropped out of school at age 16, never to return. After working as a TV repairman, he went on to become the engineering manager for Yorkville Sound in Canada, then director of research and development for QSC Audio Products in California before striking out on his own. R emember those Radio Shack kits that allowed you to explore at least rudimentary electronics? Dan Alich sure does. Alich teaches math at Macon Early College, a public high school integrated into the Southwestern Community College system in Franklin. When a former student who’d gone on to study engineering showed him a weather balloon gadget she’d made, Alich was amazed that students were just learning basic electronics after three years of college. He decided that those old electronic project kits needed to make a comeback, and that he’d be the person to fill the need. During the design and prototype phase, Alich’s vision started to gel: The device, which he dubbed the DuinoKit, should be easily accessible (with no prior expertise necessary) and should skip the soldering and loose components of the kits of yore. With an Italian Arduino microprocessor as its base, the DuinoKit’s parts are all built-in, so they can’t be lost. Once its basic capabilities become familiar, its users can set out on the path of discovery on their own: Alich says that a quick Google search reveals hundreds of projects that can be done using the microprocessor, from binary clocks and remote controls to texting devices and video games. There are two main versions of the DuinoKit, one geared toward high school and college users and a junior model for younger experimenters. And Alich keeps advancing his invention: He recently unveiled a DuinoKit that adds Raspberry Pi, a low-cost, credit card-sized computer that enables people to learn and explore programming. The model uses a touch-screen, Android-based tablet as a wireless viewing device for programming and visual feedback. Alich says his biggest hope is that the DuinoKits can make electronics and programming approachable and comprehensible to students long before they hit higher education. “One key is that the teacher doesn’t have to know everything about it,” he says. “The students just need to know the basics and then they can do projects on their own.” Such self-directed learning builds not just knowledge but also self-confidence, he says, and the DuinoKit shows just how contagious the spirit of invention can be. With engineering and industrial design degrees from North Carolina State University and years of experience in product development, Mike Scully dreamed of designing and producing a multifunctional tool that users can take with them wherever they go. After moving from San Francisco to Asheville with his family in the summer of 2015, Scully started Lever Gear, a company devoted to products that solve real problems, work flawlessly, and stand the test of time. Lever Gear’s initial offering is the Toolcard. Scully designed a prototype and gauged interest in the invention with crowd-funding campaigns that proved shockingly successful. A Kickstarter effort raised more than $65,000 to get the project off the ground. Then, an Indiegogo campaign for pre-orders of the Toolcard brought in more than $85,000 (as of the writing of this article)—far surpassing Scully’s goal of $12,000. Similar multitools already existed, so why all the excitement about Scully’s? For one, he scrutinized existing models to find their best and worst qualities. 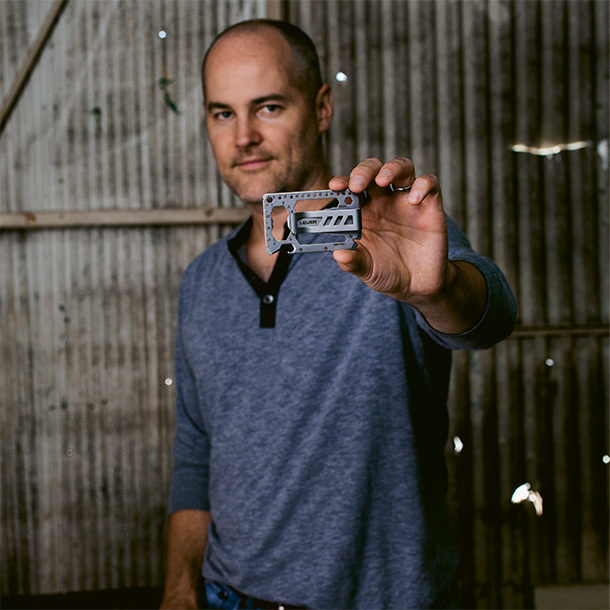 Based on what he learned, he designed the Toolcard, which incorporates 40 tools and a detachable money clip. The compact, stainless steel device features a bottle opener, can opener, cord cutter, wrenches, screwdrivers, rulers, a pry bar with a nail puller, and much more. The Toolcard costs $29, and importantly, it is compliant with TSA regulations, so you can carry it with you during air travel.